Tell your story by creating a personalised hard cover photo books. Add captions, headers and dates to document all the little details of your most memorable moments. So, get creative and order your custom photo book from bonusprint. Whether you’re making a wedding album or showing off your holiday snaps, you’ll find a hard cover to suit your photo book style. You can pick a classic faux leather cover for a traditional finish, or choose a quality linen cover. And to add a personal touch, you can even make a hard cover for your photo album with your own images. Our hard cover books come in a variety of sizes too, so you can create a hardback coffee table book or a durable little album to take with you on your travels. It’s so easy to create a hard cover photo book. Head to our online or offline creator tool where you’ll see a range of hard and soft cover books to choose from. You can then filter by size and format. One of our small 13 x 10 cm hard cover books would make a thoughtful little gift. 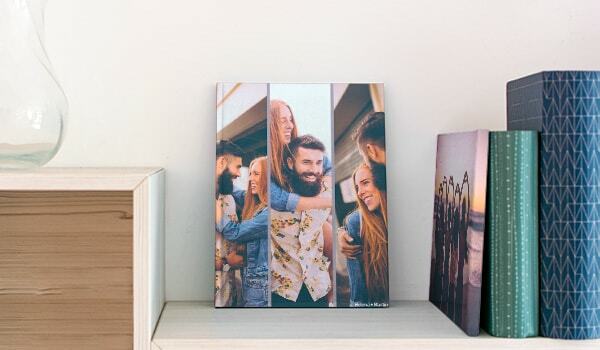 But if you want a big statement album for your home, you can make an extra-large 39 x 29 cm photo book with a hard cover. When you’ve picked the style you want, it’s time to get creative with your snaps. With the creator tool, you can play around with the layout of your photos and customise your hard cover book with clip art, masks and backgrounds. You can personalise your cover with an image in the creator tool too. When you’re happy with your layout, click ‘add to basket’. If you didn’t want to upgrade to a photo cover, you can choose between linen or faux leather in this step. And you can pick glossy photo paper for your book as well. Then you’re ready to order and have your custom photo book delivered to you.